Are U.S. Treasury Bonds Breaking Out? In recent weeks, I’ve been keeping my eye on an interesting situation: while the majority of market participants expect higher interest rates (and lower bond prices), the “smart money” are expecting the opposite. The mainstream view is that the economic boom is humming along nicely, jobs are being created left and right, there are few economic or financial risks to worry about, and that inflation will start picking up any day now. The reality, however, is that our economy is far too saturated with debt to grow at a very high rate like in past economic cycles and that investors are overestimating the potential efficacy of President Trump’s pro-economic growth policies. 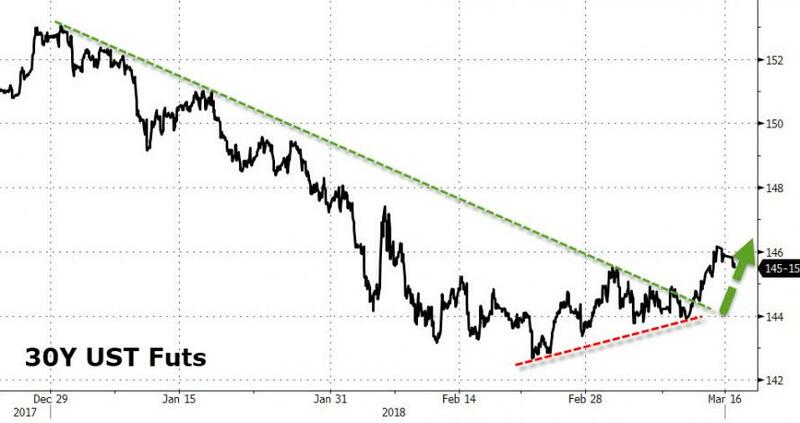 From a strictly technical analysis perspective, U.S. Treasuries have been forming triangle patterns in the past several weeks as market participants digest the February market correction and its implications, as well as wait for more data to confirm the risk of a pickup in inflation. Interestingly, these triangle patterns are breaking out to the upside today. A slew of weak economic and inflation data has been causing investors to pare back their expectations for much higher interest rates in the shorter-term: the CPI-U increased only 0.2 percent in February (after increasing 0.5 percent in January), retail sales fell for the third month in a row, and Goldman Sachs and the Atlanta Fed have cut their Q1 GDP forecast to under 2.0 percent. I will certainly be watching this Treasury breakout to see if the “smart money” are about to be vindicated on interest rates. A breakdown in crude oil (which is forming its own triangle pattern) would be another catalyst that would send Treasury bonds higher.